Green Lines #324 working route Q9 at Rockaway Boulevard & Liberty Avenue. Photograph taken April 13, 1968 by Doug Grotjahn; collection of Joe Testagrose. 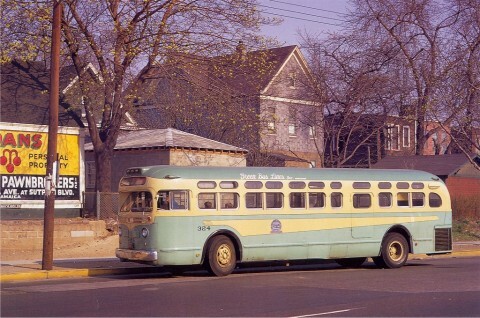 Nice shot of Green Line #324 taken somewhere in Ozone Park - 324 is a 1950 GM TDH4509 and one of 35 delivered to the property that year. This bus is in the second generation apple green and cream livery and is sporting the first of the 'dependability' decals.